I’m sitting in Cherine Magrabi Tayeb’s airy office in the Starco Building and her soft voice competes with the noise from outside the 11th floor windows, where workers are striving to repair the building’s façade, damaged in a bomb blast in December 2013. She is explaining to me how she went from working with the family business, an eyewear company, to founding the House of Today. 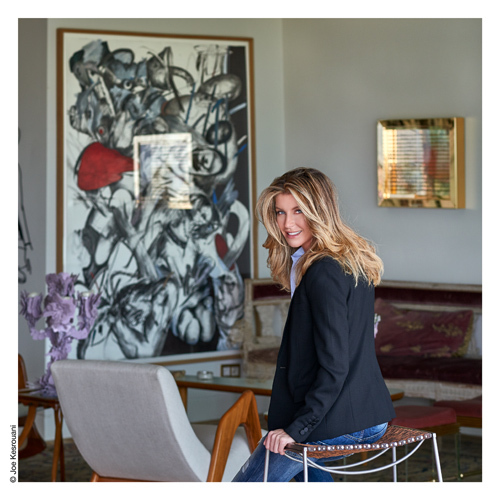 Blonde, blue eyed and openly allergic to giving interviews, the Lebanese–Egyptian appears shy at first, but quickly opens up when she begins discussing her passion for promoting young designers. Tayeb, who studied at Chelsea College of Arts, isn’t actually a designer herself, but she does have a self professed fascination with aesthetics. Founded in 2012, her non profit organization, House of Today, aims to support emerging designers in a number of ways, from organizing themed group exhibitions and helping them gain exposure, to providing funding for solo shows or independent projects and offering scholarships for those who want to further their studies. The idea came to her after she discovered something about Lebanon she had never known: there was a pool of gifted young product designers who didn’t have an outlet for their talent (beyond Beirut Design Week that is). She began to realize that it was a lack of more solid infrastructure and a continuous form of support that was preventing them from achieving their full potential. The theme was inspired by a conversation Tayeb had with a writer one day, over coffee. At the end of the meeting, he asked for her Facebook details. Tayeb told him she didn’t want him to get to know her based on a social media presence, which she describes as a projection of who she’d like to be, not a reflection of who she truly is. The broad theme led to an eclectic array of objects, from the provocative to the philosophical, among them Makram El Kadi’s stunning birdhouse, made of 2,500 stray brass bullets used for illegal hunting, and Souheil Hanna’s armchair, made to resemble a beautifully finished rosewood coffin. The work of emerging product designers was offset with work by established stars, such as fashion designer Elie Saab, who donated three specially designed clutches. Although the organization’s focus is on promoting product design, including fashion designers like Saab or jewelry designers such as Nagib Tabbah in the mix helps to create a buzz, Tayeb says, and to attract a wider audience. As word has spread, designers are increasingly sending in their portfolios, she says. A committee of well known local designers works together to decide which projects merit support. House of Today also has close ties with the Lebanese Academy of Fine Arts (ALBA) and keeps tabs on promising design students. The organization’s December exhibition made enough money to fund a booth at Design Days Dubai in March, showcasing 15 of the “Naked” pieces. It also helped Lebanese designer Carlo Massoud meet the costs of exhibiting his work with Carwan Gallery at New York’s Armory Show. On top of that, House of Today was able to offer the first two scholarships for students wishing to undertake a Masters in design, either in Lebanon or overseas.